Much prettier than a mere sprig of mistletoe, our kissing ball is a festive decoration linked to a charming custom. 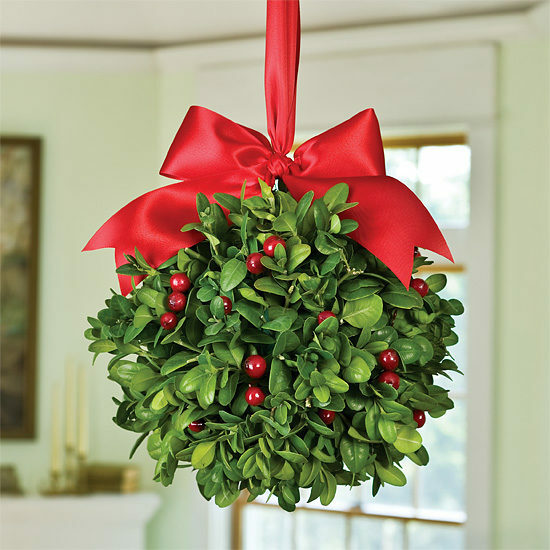 Each ball is handmade in Oregon using fresh green boxwood, with clusters of faux red and white berries and a large satin bow adding beautiful touches of everyone’s favorite holiday hues. Keep our kissing ball in mind when you’re looking for an imaginative hostess gift or something fun for your own décor. To remove, simply snip wires from the back of the box and lift the item gently. Our fresh designs are originally produced with extra elements so slight shedding is normal. To keep your display fresh for the longest possible time, you may mist it occasionally with water. The designs are best maintained when displayed indoors, away from direct sunlight, strong heat sources and extreme moisture. The color will soften as your display dries.